Our team will turn your unsightly crawl space into a beautiful area that’s both energy-efficient and allergen free. Here’s how. Mold spores, pollen, dust, etc. No matter how often you clean your house, they still find their way into your home. You don’t even have to open your windows - your crawl space is full of them and the air circulation helps them move around your house, making you cough and sneeze all day long. We have the knowledge and equipment to make the air rising up from under your house dry and allergen free. Rats and mice just love less frequented spaces that offer them quick and easy access to food and water. Oh, and the insulation makes excellent nesting material! I don’t have to tell you that these pests are prolific breeders, which is why you should act ASAP. Our technicians can help you remove these pests and make sure they stay out by rodent proofing the area. Once they’re out of the way, we’ll thoroughly clean and decontaminate your crawl space. Those small cracks and holes rodent use as entry points also let the cold air and excessive moisture get inside. In addition, too much moisture will make insulation less effective and you’ll end up running your HVAC system for longer and longer periods of time. This will, in turn, cause the unit to break down much sooner than it would have in normal circumstances. 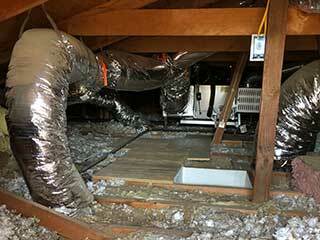 If you decide to hire Attic Cleaning Thousand Oaks you’ll actually be saving money! You’ll pay for the services of a single provider who will make the air inside your home healthier and the house more energy efficient. As a result of our services, you’ll spend less on utility bills and avoid unnecessary and untimely HVAC repair. Call today for more details!